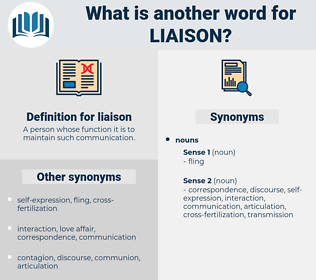 What is another word for liaison? A person whose function it is to maintain such communication. questions, liens, matters, issues, ratios. affiliations, Intermediaries, correspondents, couplings, exchanges, millions, bonds, uplinks, corridors, ties, officers, voyages, liaises. Approached, Told, lent, Urged, added. investigating, interacting, approaching, sleeping, getting. Consulted, involved, interlinked, Obtained, Displaced, combined, located, coupled, tied, directed, Approached, traced, Urged, requested, Pegged, liaised, liaise. contact, liason, liaise, linkage, linkages, Liaising. 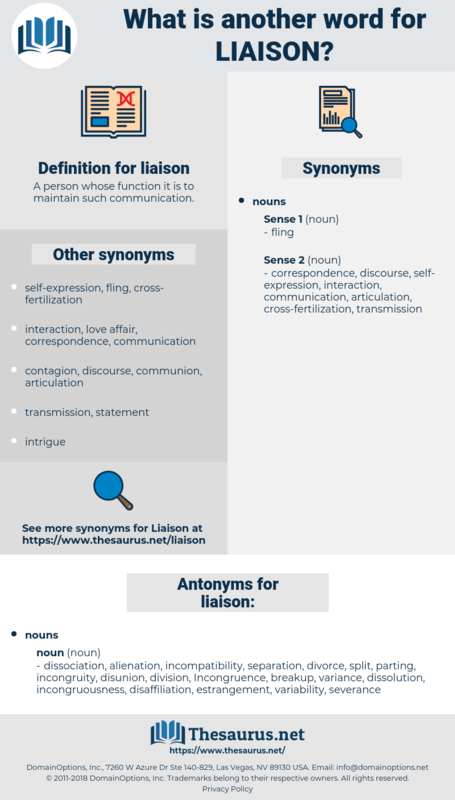 conjunction, bond, interconnection, affair, contact, liaise, linkage, interrelationship, link-up, Matchmaking, Concertation, handshake, Liaising. dissociation, alienation, incompatibility, separation, divorce, split, parting, incongruity, disunion, division, Incongruence, breakup, variance, dissolution, incongruousness, disaffiliation, estrangement, variability, severance. Up to three or four days before his death, Hugh Dawnay had been my liaison officer with the 1st Corps. lasagna, lagoon, lucknow, lock in, loosen, log on, like sin, lesson, look on, lycium, laguna, lesion, lagune, lycian, lcm, liken, luzon, lay eyes on, logania, Lushun, lexeme, lysozyme, legume, lexicon, leucine, leukaemia, lycaeon, loose woman, lysinemia, loxoma, laocoon, lignum, leucoma, leucaena, logicism, lissom, laconian, lasagne, log in, lysine, logan, louisiana, luscinia, locum, lacuna, loose cannon, leukoma, Lazy Susan, lissome, logician, logion, legin, ligne, lysosome, lagan, lessen, leishmania, leucaemia, louisianan, locoism, lignin, lucania, lysogeny, liquaemin, legion, laconia, lockman, lyceum, ligan, lakshmi, lichen, logomania, liegeman, lausanne, lycaena, logjam, louisianian, leukemia, log-in, leccinum, lysin.